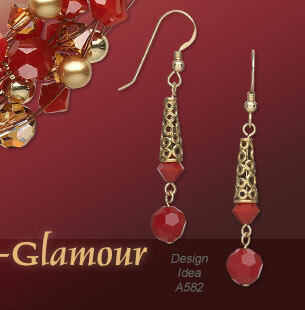 Glamour is the game for the Demure Decadence trend--a rich mix of saturated color and global style. It's a trend of opposites, melding East with West, decadence with austerity, opulence with minimalism and large with small. It's a global trend, drawing from cultures both regional and international, to create a new look using ornamentation, decorative prints and historical themes and motifs. Demure Decadence says Europe is no longer in charge of style and European minimalism is only a backdrop to the real trends of lavish ornamentation and opulent accessories patterned after regional and ethnic traditional designs. It's not all about the reds, though. 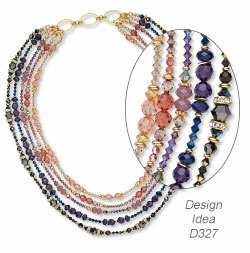 There are saturated tones of purples and blues, adding depth to a palette already rich with gemstone color, including sapphire, tanzanite and crystal lilac shadow. Together, they mix with some light browns and metallic golds for a practical palette that's also theatrical. Use crystals in light silk, crystal bronze shade and vitrail as well as metallic light gold and crystal golden shadow to add highlights and contrasts to this color scheme. 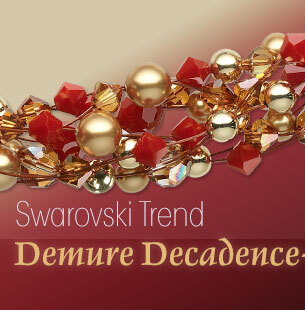 Demure Decadence is a trend which counters its own impulses, using the push-pull of opposite forces to power its style. It's about a diversity of materials united in a common cause. Demure Decadence uses minimalistic settings, clothing and accessories--then lavishes them with opulent embellishments. 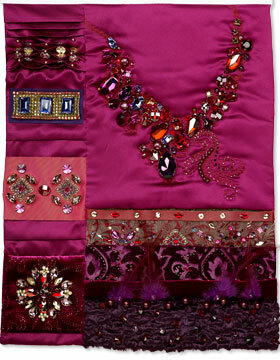 It's the single black silk cord maintaining an ornate pendant tumbled with pearls, crystals and gold. 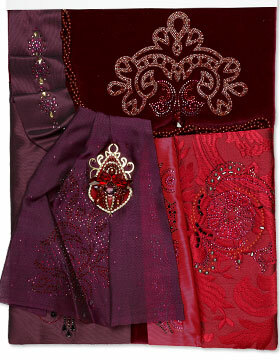 It's the box clutch with one crystal-covered side. It's the A-line dress covered in intricate patterns picked out in hotfix flat backs. Demure Decadence is a trend of opposites uniting in a common cause. It's a response to Austerity Fatigue, a rejection of the idea that less is more. It uses the ancient patterns and designs of the booming economies of the East (such as Vietnam, India and China) and interprets them in modern materials on the clean lines of minimalist western fashions.